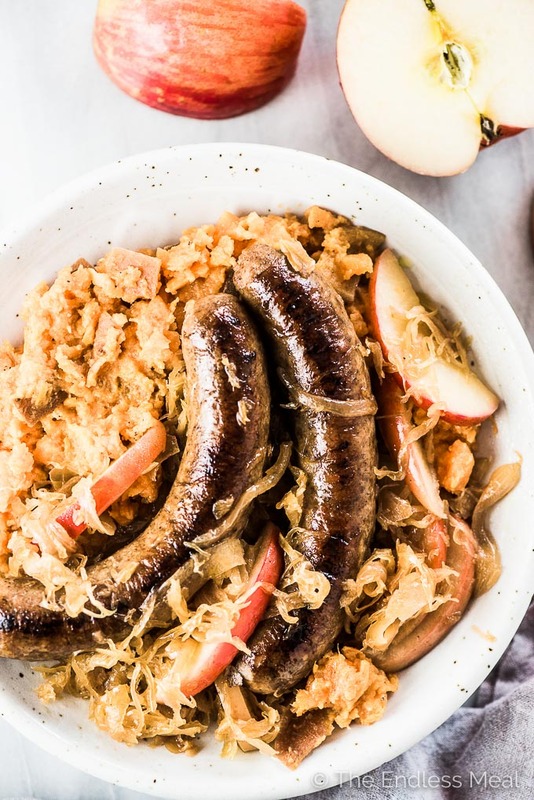 Bratwurst and Sauerkraut is the ultimate autumn comfort food recipe. The brats are browned in a pan then stewed with sauerkraut, and apple juice. Apple slices are popped in at the end for a touch of sweetness. This traditional German recipe is a personal family favorite. Warning: serious comfort food ahead! 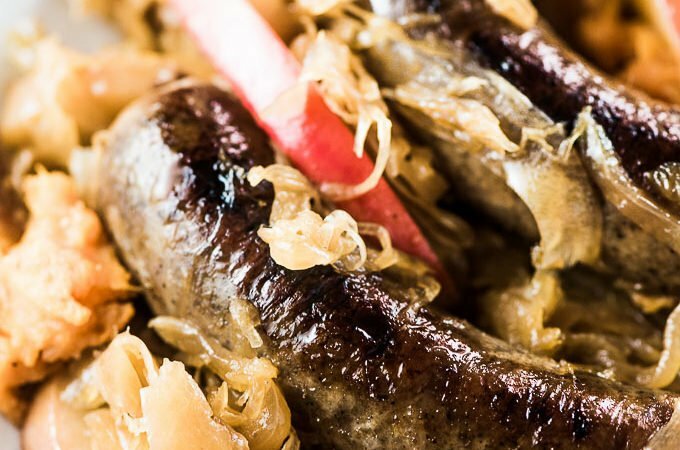 This bratwurst and sauerkraut recipe is my mom's recipe and the one I grew up eating. It's the same one that she remembers my grandma making her as a child. Until today, it wasn't a written recipe. When I asked my mom (because why Google when you have a mom?) how to cook sauerkraut and brats I got an answer that went something like: “brown the bratwurst then put a bunch of sauerkraut in the pan with some apple juice and cook it until it's done.” I was told that you can add bacon or apple slices to switch things up but I never got any clarification on quantity. 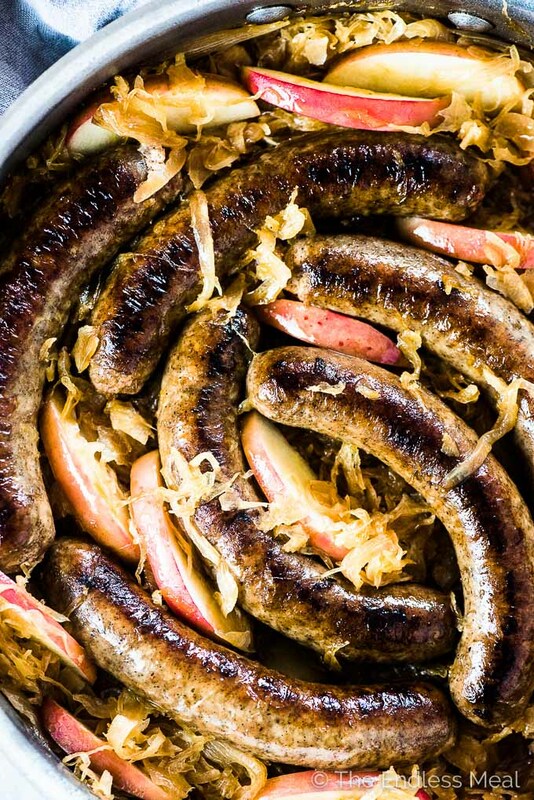 I think that's the beauty of this bratwurst and sauerkraut recipe; it's impossible to mess up. Your favorite fresh sausages, browned and juicy. Lightly tangy sauerkraut with a touch of crunch. Perogies – let's be clear, this is NOT a perogy recipe. But if you serve the bratwurst and sauerkraut over potatoes with a generous dollop of sour cream all you're going to think about is perogies. ←truth! 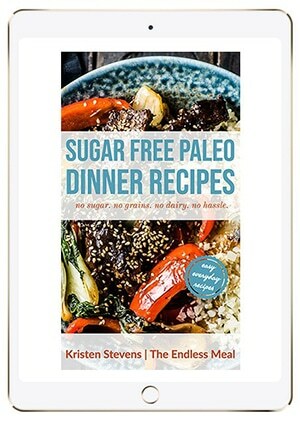 Gluten-free + paleo + Whole30 long before any of us had heard about those in words. According to mom, bratwurst and sauerkraut can be made with beer or chicken stock but it is best made with apple juice. And if you're going to use apple juice (which you should) then you want to use the best apple juice around. AKA: North Coast Organic Apple Juice. One sip sent my mind racing back to childhood memories of grandma's homemade apple juice. I never thought anything could come close to hers but North Coast's no added sugar and no preservatives apple juice nails it. And if you'd like to win a year's supply of North Coast products (you know you want to!) make sure to enter on their Facebook page! Sidebar → Have you noticed how short the days are getting? It happens so fast! With daylight savings coming to an end soon, we'll be eating an early dinner in the dark before we know it. Maybe it's the change in light or cool air but my craving for comfort food is big this time of year. It's all about fall flavors and warm, one-pot recipes that makes my heart happy. Like this bratwurst and sauerkraut. 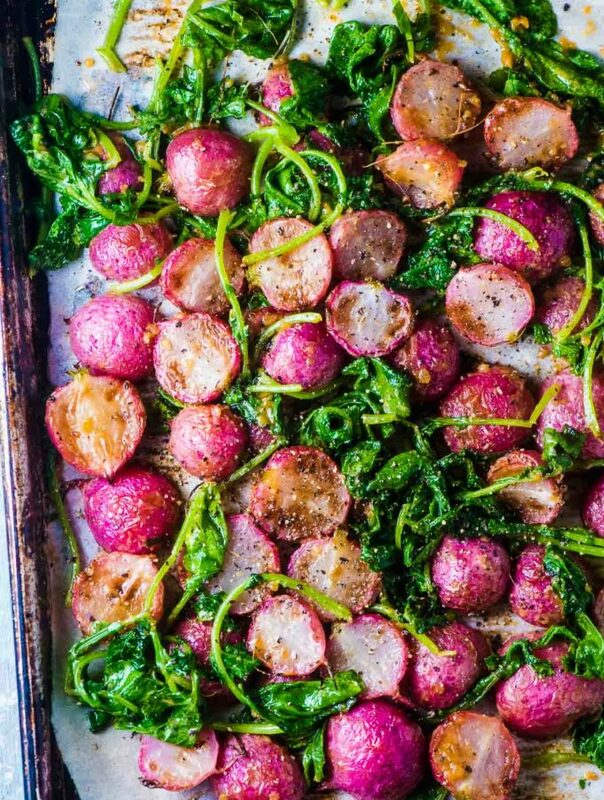 There's big-time happiness when we sit down to this easy dinner recipe. 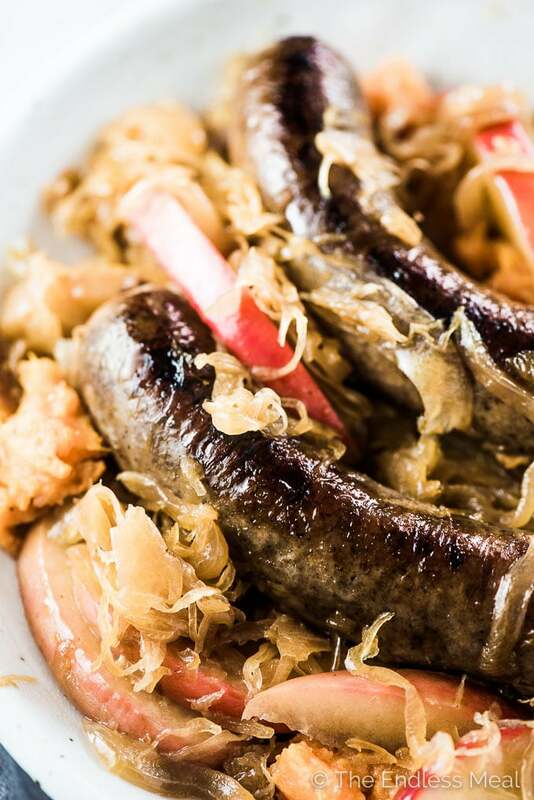 We like to serve the brats and sauerkraut over some gently mashed potatoes. You can also mix them into the pot, just like my mom does. 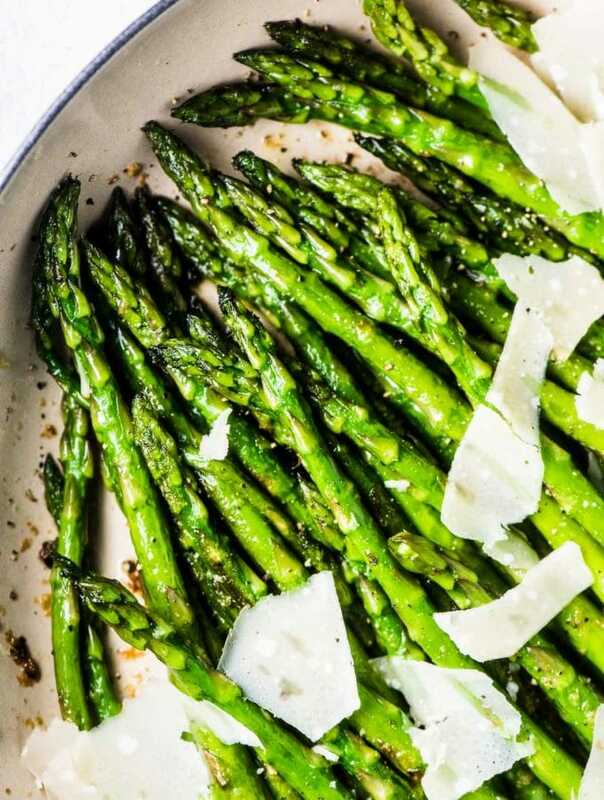 There's no reason not to keep this recipe as simple as possible. I've also switched things up served this over mashed sweet potatoes for paleo bratwurst and sauerkraut. It's just as delicious. And I've heard that you can make a bratwurst and sauerkraut sandwich by filling a bun with a brat and topping it with the sauerkraut. I've never done that but I honestly kicking myself for not trying that. Doesn't that sound delicious? Melt the butter in a large, non-stick frying pan over medium-high heat. Add the bratwurst and cook until brown on both sides, about 10 minutes. While the bratwurst are browning, place the diced potatoes or sweet potatoes in a medium-sized pot and cover with water. Bring to a boil over high heat then reduce the heat and simmer until the potatoes are tender, about 10 minutes. Drain then add the salt, pepper, and 2 tablespoons of the North Coast Organic Apple Juice and gently mash. You want to keep some chunks. When the bratwurst is brown on both sides, remove it from the pan then add the onion. Cook until the onion begins to brown then add the sauerkraut and mix well. 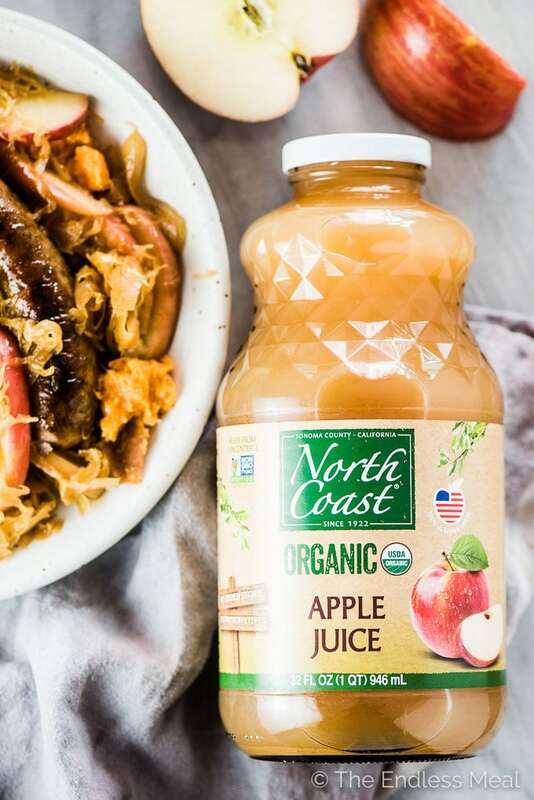 Add the bratwurst to the pan then pour the remaining 2 cups of North Coast Organic Apple Juice over the top. Cover the pan and cook for 20 minutes. Remove the cover and cook for another 10 minutes, or until the pan is mostly dry. Nestle the apple slices around the bratwurst and cook for 5 minutes more. Serve the bratwurst and sauerkraut over the potatoes. The best apples for this recipe are gala, ambrosia, or fuji. A scoop of sour cream on the side makes this extra awesome. 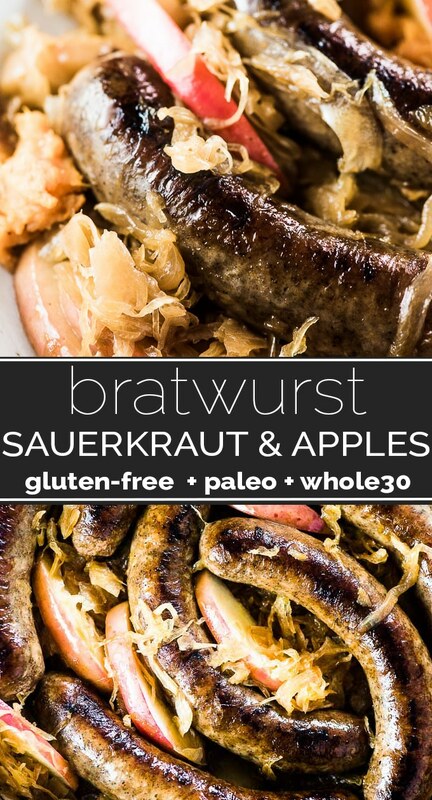 This is hands down the best recipe for brats & kraut I’ve ever had! And I can’t tell you how many recipes I’ve gone through… I love north coast organic apple products as well, great pick! What kind of sauerkraut do you usually get? A lot of people prefer the canned stuff with vinegar but I prefer fermented sauerkraut like Bubbie’s (no vinegar or preservatives). I’m so making this again, probably going to be an every month meal. Thanks for sharing! My favorite is my mom’s homemade sauerkraut. It’s so good! I’ve had Bubbies before and it’s really really good! I can’t tell you how many brats I’ve eaten, and having been raised by Poles, I’ve been eating sauerkraut since I grew teeth. Yet I’ve never thrown apples into the mix! And why not? It sounds fantastic. Apples are so good in it! Brats are the best, aren’t they?!! It definitely does temper the sauerkraut. Also, not all sauerkraut is the same so you might want to try a few different brands to find the one you like best. My favorite is my mom’s homemade sauerkraut. I’ll have to see if she’ll share that recipe with me!